It's always nice to see family-friendly films that work on different levels for both the younger viewers and the older viewers (you know, the ones that actually paid for the big screen television and 20.whatever multisuper stereo sound system). The original Shrek was a great example of this, though of course there have been many others. 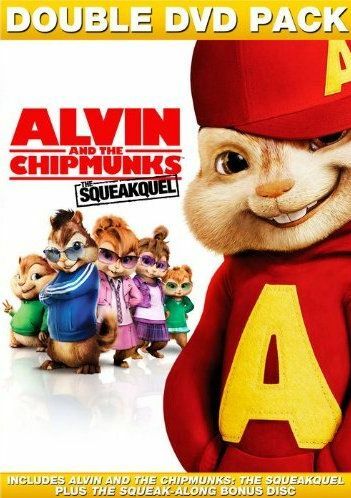 Unfortunately Alvin & The Chipmunks: The Squeakquel is not really one of these films. Not that it's a terribly awful movie or anything, just that this is primarily a kids' flick with not a whole lot going on for us who expect a bit more substance. Kids will probably enjoy it, but there is very little here for adults. Like the first film, this movie is a live-action venture where the Chipmunks are all fully computer generated characters, and they are pretty good looking. They usually blend nicely into their scenes, and come across as photo-realistic with naturally-looking fur despite being Anthropomorphic chipmunks. There are times when you can tell there really wasn't anything there, but overall it was done pretty well, especially considering how much of the movie those little guys (and gals) show up in. That's a lot of special effect shots for a kid's film! The one main thing that really surprised me here is that Dave Seville was barely in it. Dave, for those that don't know, is the adopted human father of the three chipmunks, Alvin, Simon, and Theodore. Instead, Alvin accidentally causes Dave to become injured during a concert in Paris, so the trio is set to be looked after by their Aunt Jackie... except that her grandson, Toby Seville, accidentally injures her so now he is tasked with looking after the boys. But even he plays a fairly small role in the film, severing very little actual purpose. There are two basic story threads in the film, the first dealing with Alvin, Simon, and Theodore going to school for the first time, and the second involves three new singing female chipmunks that are looking to make it big like their male predecessors. I was kinda shocked that the boys were put into a high school, because I had always thought they were like preteens, elementary school-level kids. And then when they're in school, they get bullied by the jocks because they are so popular (which doesn't make a whole lot of sense), and then Alvin befriends the jocks when they notice he has skills in catching a ball, and for some reason turns on his brothers to become a huge jerk. That whole thing just didn't feel natural to me. Meanwhile, the Chipettes coincidentally hook up with the Chipmunks's old evil manager from the first film, and so he starts managing them into the next huge group. He lies to do it, but he does indeed do it, and then for some reason he takes a strange turn to try to kick two of the Chipettes out of the band, even though he already booked them all a major gig that would make them all rich and famous. It just didn't make any sense at all to me. There was no reason for them to do that other than the people making the movie needed a way to get the Chipetts to hate the guy and befriend the Chipmunks, but surely there could have been a better way to write that in. Okay, so eventually there's this big music competition at the end, with two amazing performances prior to the Chipmunks, and then then Chipmunks and Chipettes bust out together to perform "We Are Family", that really old song from like the 1970s. The rest of the music in the film was recent, modern hits and then they broke out with that one, which I don't even think is all that great. Definitely not what I would consider to be a great showdown performance, and definitely not deserving of winning based on the other performances. Kids may enjoy the Chipmunks and their squeaky high-pitched performances and individual attitudes, but the plot is really weak all way around and there isn't much real humor other than various slapstick stuff that you've probably seen done better many times before. The Music Mania is the same as the one on the first disc, and the Shake Your Groove Thing! with Rosero is actually one of those featurettes which instruct you step-by-step on dance moves (my wife likes those). Meet the Stuffies! is a stupid little featurette about the stuffed animals the filmmakers use to stand in for where the CGI chipmunks will be placed in post production. Alvin & The Chipmunks: The Squeakquel (2 Disc) , released by 20th Century Fox, is available starting March 30, 2010.